Since Microsoft SharePoint 2013, most of the enterprise solutions built on top of Office 365 and SharePoint Online leveraged the JSLink property of fields and list views to customize the rendering of fields. However, within the new "modern" UI of SharePoint Online, most of those customizations are no longer available. Fortunately, with the new SharePoint Framework Extensions, you can now provide almost the same functionality in the "modern" UI. In this tutorial you learn how to migrate from the old "classic" customizations to the new model based on SharePoint Framework Extensions. 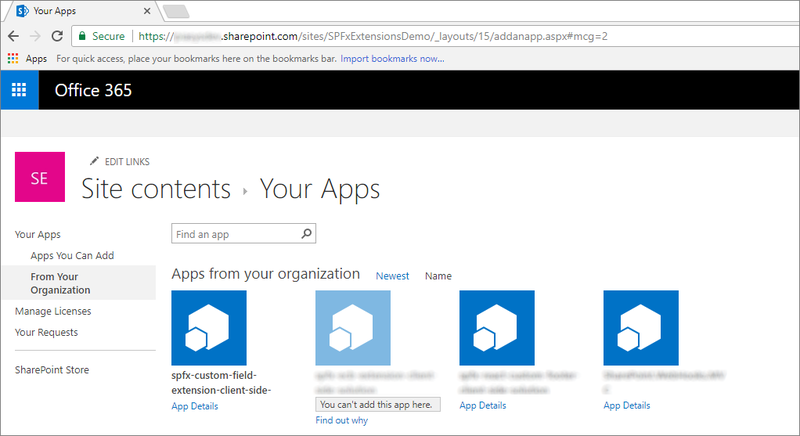 For more information about how to build SharePoint Framework Extensions, see Overview of SharePoint Framework Extensions. Application Customizer. 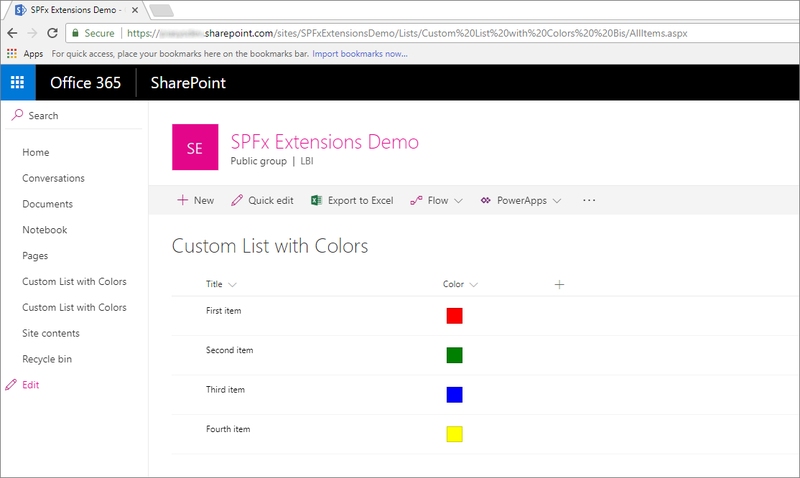 Extend the native "modern" UI of SharePoint Online by adding custom HTML elements and client-side code to pre-defined placeholders of "modern" pages. At the time of this writing, the available placeholders are the header and the footer of every "modern" page. Field Customizer. Customize the rendering of a field in a list view by using custom HTML elements and client-side code. The most useful option in our context is the Field Customizer extension. 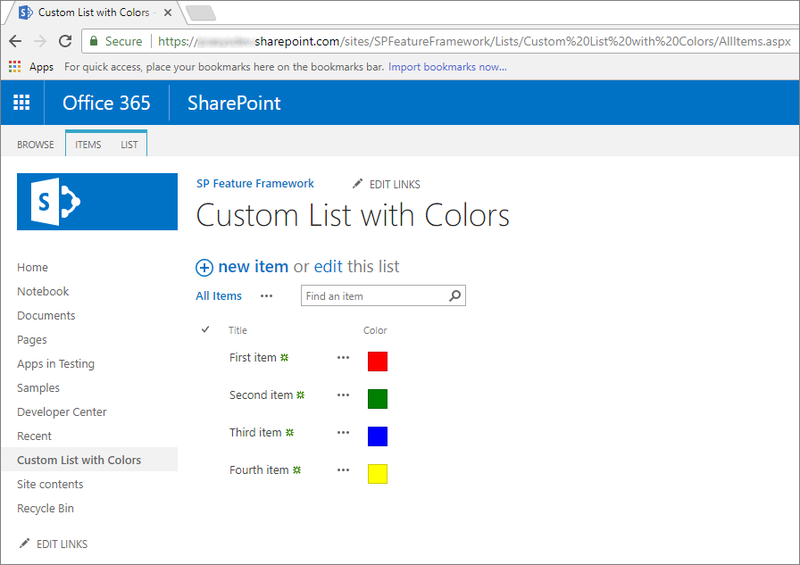 Assume that you are in SharePoint Online, and you have a custom list with a custom field called "Color", which is of type Choice and which can assume the following values: Red, Green, Blue, Yellow. Assume that you have a custom value for the JSLink property of the list view rendering web part of the custom list. Moreover, in the following screenshot you can see how the JSLink property is configured in the list view web part. For the sake of completeness, you can see how the custom rendering of the list works. As you can see, "Color" fields render a colored box filled with the color selected at the item level. To provision this kind of solution in a "classic" site you can eventually use a PnP provisioning template, which can provision both the list with the custom field, and the JSLink property at once. To migrate the previous solution to the SharePoint Framework, see the following steps. Before following the steps in this article, be sure to Set up your development environment. Accept the default name spfx-custom-field-extension for your solution, and select Enter. 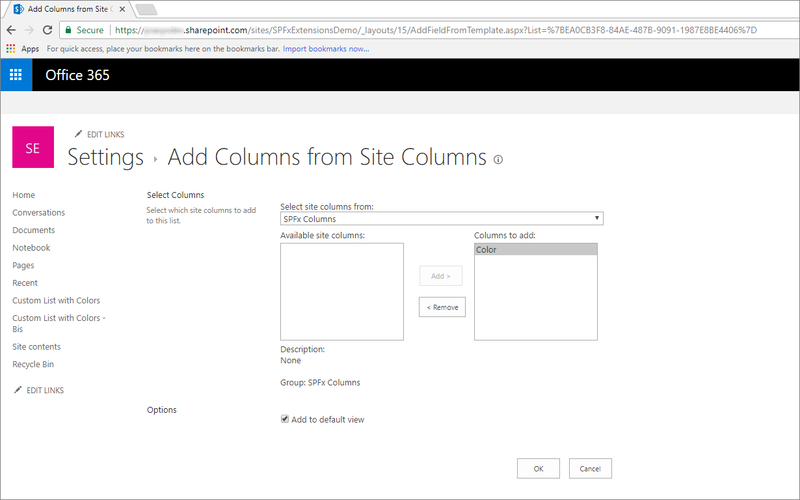 Select SharePoint Online only (latest), and select Enter. Select Use the current folder, and select Enter. Select N to require the extension to be installed on each site explicitly when it's being used. Select Extension as the client-side component type to be created. Select Field Customizer as the extension type to be created. Provide CustomColorField as the name for your Field Customizer. At this point, Yeoman installs the required dependencies and scaffolds the solution files and folders along with the CustomColorField extension. This might take a few minutes. Start Visual Studio Code (or the code editor of your choice) and start developing the solution. To start Visual Studio Code, you can execute the following statement. To reproduce the same behavior of the JSLink custom field rendering, you need to implement the same logic by using client-side code within the new SharePoint Framework solution. To accomplish this task, complete the following steps. Open the file CustomColorFieldFieldCustomizer.manifest.json in the src/extensions/customColorField folder. Copy the value of the id property and store it in a safe place because you need it later. * it will be deserialized into the BaseExtension.properties object. * You can define an interface to describe it. // for the returned promise to resolve before firing any BaseFieldCustomizer events. // This method should be used to free any resources that were allocated during rendering. To retrieve the current field value, you need to read the event.fieldValue property of the input argument of the onRenderCell method. To return the custom HTML code to render the field, you need to assign a value to the innerHTML property of the event.domElement object, which represents the output HTML container of the field rendering. In the following figure, you can see the resulting output. Go back to the console window and run the following command to build the solution and run the local Node.js server to host it. Open your favorite browser, and go to a "modern" list, which has a custom field with the name Color and the type Choice with the same value options as before (Red, Green, Blue, Yellow). You can eventually use the list you created in the "classic" site, just viewing it with the new "modern" experience. Now, append the following query string parameters to the AllItems.aspx page URL. In this query string, replace the GUID with the id value you saved from the CustomColorFieldFieldCustomizer.manifest.json file, and the Color object name refers to the name of the field to customize. If you like, you can also provide a custom configuration object, serialized in JSON format, as an additional parameter for the field customizer construction. Notice that when executing the page request, you are prompted with a warning message box with the title "Allow debug scripts? ", which asks your consent to run code from localhost for security reasons. Of course, if you want to locally debug and test the solution, you have to allow it to "Load debug scripts." 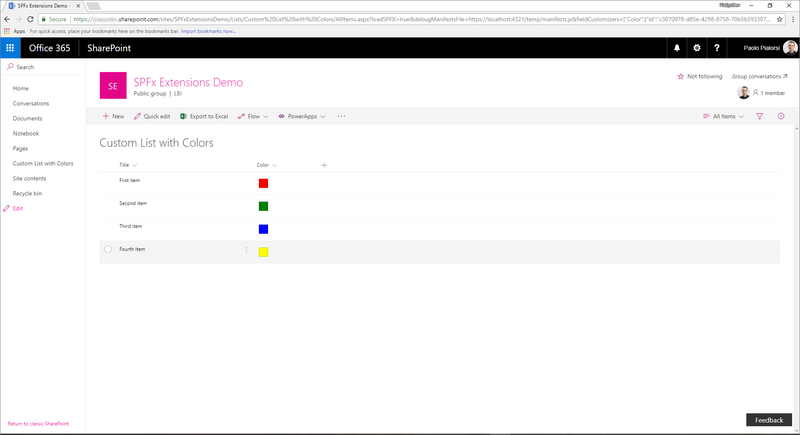 Open the file CustomColorFieldFieldCustomizer.module.scss in the src/extensions/customColorField folder. This file, which is a Sass CSS, represents the UI style for the field customizer. Replace the content of the SCSS file with the following. Replace the implementation of the onRenderCell method with the following code excerpt. Notice that the new method implementation uses a fully typed approach, and assigns the cell CSS class to the DIV element child of the current field element, together with another custom CSS class to define the target color of the DIV based on the currently selected value for the field. Run the Field Customizer one more time in debug mode and view the results. If you are happy with the result, you are now ready to package the solution and host it in a real hosting infrastructure. Before building the bundle and the package, you need to declare an XML Feature Framework file to provision the extension. In the code editor, open the /sharepoint/assets sub-folder of the solution folder and edit the elements.xml file. In the following code excerpt, you can see how the file should look. 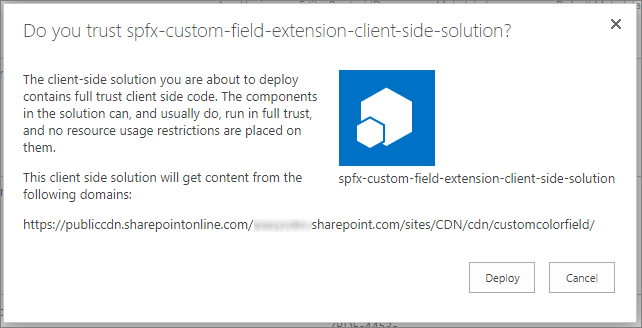 As you can see, it reminds us of a SharePoint Feature Framework file, but it defines a custom Field element with a field type Choice, which uses the ClientSideComponentId attribute to reference the id of the Field Customizer, and there could be a ClientSideComponentProperties attribute to configure the custom configuration properties required by the extension. Open the package-solution.json file in the /config folder of the solution. Within the file, you can see that there is a reference to the elements.xml file in the assets section. Now you need to host the extension in a hosting environment. Office 365 CDN is the easiest way to host SharePoint Framework solutions directly from your tenant while still taking advantage of the Content Delivery Network (CDN) service for faster load times of your assets. Download the SharePoint Online Management Shell to ensure that you have the latest version. Public CDN has now been enabled in the tenant by using the default file type configuration allowed. This means that the following file type extensions are supported: CSS, EOT, GIF, ICO, JPEG, JPG, JS, MAP, PNG, SVG, TTF, and WOFF. Open up a browser and move to a site collection where you'd like to host your CDN library. This could be any site collection in your tenant. In this tutorial, we create a specific library to act as your CDN library, but you can also use a specific folder in any existing document library as the CDN endpoint. Create a new document library on your site collection called CDN, and add a folder named customcolorfield to it. In the PowerShell console, add a new CDN origin. In this case, we are setting the origin as */cdn, which means that any relative folder with the name of cdn acts as a CDN origin. Note that your newly added origin is listed as a valid CDN origin. Final configuration of the origin takes approximately 15 minutes, so we can continue provisioning the extension, which is hosted from the origin after deployment is completed. When the origin is listed without the (configuration pending) text, it is ready to be used in your tenant. This indicates an on-going configuration between SharePoint Online and the CDN system. Next, you need to update the solution to use the just created CDN as the hosting enviroment, and you need to publish the solution bundle to the CDN. To accomplish this task, follow these steps. Return to the previously created solution to perform the needed URL updates. Execute the following task to bundle your solution. This executes a release build of your project using the CDN URL specified in the write-manifests.json file. The output of this command is located in the ./temp/deploy folder. These are the files that you need to upload to the SharePoint folder acting as your CDN endpoint. Execute the following task to package your solution. 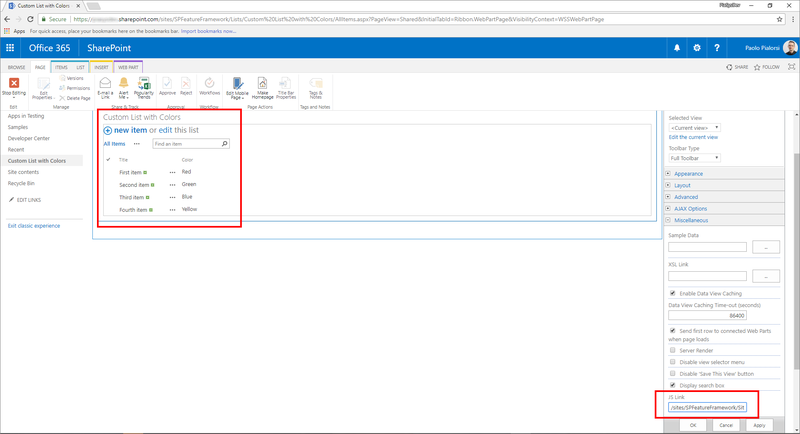 This command creates an spfx-custom-field-extension.sppkg package in the sharepoint/solution folder and also prepares the assets in the temp/deploy folder to be deployed to the CDN. Upload or drag-and-drop the newly created client-side solution package to the app catalog in your tenant, and then select the Deploy button. Upload or drag-and-drop the files in the temp/deploy folder to the CDN/customcolorfield folder created earlier. Open the browser and navigate to any target "modern" site. Go to the Site Contents page and select to add a new App. Select to install a new app From Your Organization to browse the solutions available in the app catalog. Select the solution called spfx-custom-field-extension-client-side-solution and install it on the target site. After the application installation is completed, create a new custom list, edit the list settings, and add a new column from already existing site columns. Select the group of columns called SPFx Columns and add the Color field. Edit the just added field and configure some color values ( such as Red, Green, Blue, Yellow), and then save the field settings. Add some items to the list and see the output in the list view. It should look like the one in the following screenshot. Enjoy your new Field Customizer built by using the SharePoint Framework Extensions!